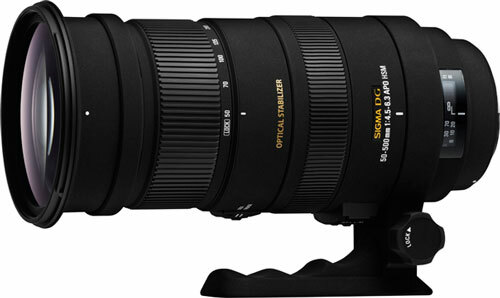 Sigma’s new 50-500mm F4.5-6.3 APO DG OS HSM is both a mouthful and a handful. Tipping the scales at almost 2kg, and with a 95mm filter thread, the initial temptation is to wield it like a grenade launcher. Sigma calls it the perfect all-round lens; most photographers simply call it the Bigma. First, let’s demystify some of the nomenclature. APO means apochromatic, and refers to specifically shaped and coated lens elements that are designed to mitigate the inescapable optical compromises like chromatic aberration (CA) inherent in zoom lenses (as opposed to fixed-focal length lenses, also known as prime lenses). CA is certainly well managed across the Bigma’s range, no small feat with a range so large. In Sigma terminology, DG means a lens is optimised for digital cameras, but Sigma claims the benefits can also be seen when using slide film (or positive, rather than negative, film) in a 35mm camera. It’s not to be confused with DC, which denotes a lens as only suitable for cropped-sensor digital cameras. The Bigma likes full-frame and crop sensors alike. The last two, OS and HSM are pretty straightforward. The first refers to the lens’s built-in optical stabilisation feature and the second to the hypersonic motor used to focus the lens quickly and quietly. The optical stabilisation works on all makes of camera, even Sony and Pentax — which have in-camera rather than in-lens stabilisation — and its effects are visible in the viewfinder. That’s one of Sigma’s great strengths — its lenses are generally slightly cheaper than proprietary equivalents and they’re generally available in every major mount. That’s certainly the case here — the Bigma is available for Canon, Nikon, Pentax, Sigma (of course) and Sony cameras, with only minor variations between mounts. The Bigma has been around for some time and the most noticeable change in this incarnation is the increase in filter diameter from 86mm to 95mm. Thoughtfully, Sigma includes a 95-86mm step-down ring with the Bigma for those using cropped-sensor bodies, which means they needn’t worry about vignetting or for those with an existing collection of 86mm filters. Aside from those who like getting oohs and aahs from other photographers, just who is the Bigma aimed at? Despite its weight, with it’s 50-500mm zoom range, the lens is aimed squarely at landscape, nature and wildlife enthusiasts as it’s equally useful for landscape shots as it is for birding or photographing game, though it’s no doubt also popular with fans of candid street photography and peeping Toms. It certainly offers unrivalled flexibility in terms of zoom, but is unlikely to be particularly popular with live-performance or sports photographers who need to freeze high-speed action. This is because of its slow aperture (f4.5 at the wide end and f6.3 at the long). As with most lenses, the Bigma performs best when stopped down by a couple of stops, which means it really is a good-light-only lens. Nevertheless, in good light the Bigma performs as expected. Autofocus is nearly silent and fast, even when going from minimum to maximum focus. We used a Canon 30D to review the lens, and while it did hunt for focus occasionally when faced with a complicated scene, research suggests this has more to do with the camera than it does with the lens. Impressively, the Bigma maintains a short minimum focus distance throughout its zoom range — from a respectable 0,5m at 50mm to an impressive 1,8m at the long end. The sweet spot is around the 200mm mark where the Bigma offers its maximum magnification of 1:3.1. This means that you’ll be able to take a picture of a flower on the ground at your feet as easily as a picture of an eagle halfway up a cliff face. Build quality is everything you’d expect from a lens of this calibre and includes Sigma’s characteristic powder-coated finish. It comes packed with a padded carry case, a shoulder strap, the aforementioned step-down ring, an enormous petal hood and, although it’s not mentioned on the box, instant peer approval. Like all lenses of this size, the Bigma includes a tripod collar that also functions as a hand rest when shooting handheld, and a handle for carrying the beast from place to place. While shooting handheld is possible, it gets tiring quickly, and anyone seriously considering this lens should buy a monopod to go with it. To prevent lens creep, there’s a lock switch midway down the barrel of the lens that locks it at 50mm. Closer to the mount are two more switches, one to switch between auto and manual focus, and the other to control the optical stabiliser. The focus switch is unlikely to see much use, though, because, like most top-end Sigma lenses, the focus ring can be used to override autofocus at any time. One of the benefits of longer lenses is the ease with which one can separate a subject from its background. The Sigma does a great job of this, even when stopped-down, making it surprisingly well suited to daylight candid portraiture. You do, however, risk looking more than a little bit creepy. The Bigma is punted as an all-rounder’s dream. Add an 18-55mm kit lens to your bag and with just two lenses you can cover 18-500mm; or, on a Nikon, Pentax or Sony cropped sensor, 27-750mm (the range is marginally longer when using a Canon as its magnification factor is 1,6x rather than 1,5x). But as the Bigma weighs more than most cameras, even those with battery grips, it’s hardly the ideal solution if you only expect to use the 50-300mm range. Of course, most people investing in the Bigma will want it for the long end, and in that case they may also want to consider Sigma’s slightly smaller, lighter and cheaper 150-500mm.